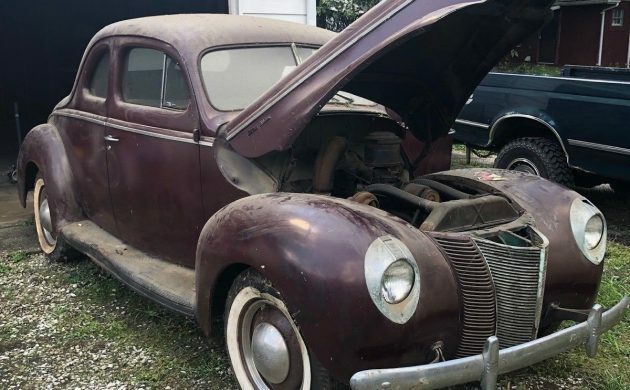 FROM 10/6/18 – This 1940 Ford Deluxe Coupe is basically original and has been parked since 1973. It has only emerged in the last week and is listed for sale here on eBay. Located in Fort Wayne, Indiana, it is offered with a clear title. We’ve seen some cars for sale that have been the subject of spirited bidding, and this one certainly is another example. From an opening bid of $200, 62 bids have seen the price rocket to $20,200 in four days. This old Ford looks to be in good condition. The paint is not original, having undergone a respray in 1960. It has held up really well, and some of the clean spots indicate that the car might respond well to a bit of work with some polish. There are no real signs of major corrosion issues and the shed in which it was stored looks like it is a fairly dry environment. This helps the cause no end. The interior looks to be complete, and also looks to be reasonably serviceable. The upholstery, headliner and door trims look like, as with the exterior of the car, a good clean might just revive them. There are a couple of tears in the driver’s door trim, but these may be able to be fixed with blind patches. Under the hood is the 221ci flat-head V8 which is backed by a manual transmission. 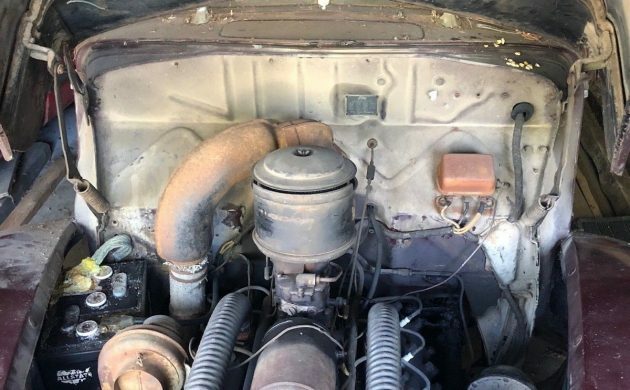 The seller gives no indication as to whether the car runs, but given the amount of time that it has been sitting, I would expect that the answer to that question would be no. Sadly he also doesn’t indicate whether the engine actually even turns by hand, or whether it is locked. I will say that it looks remarkably clean and dry under there, so that may augur well for the engine’s condition. 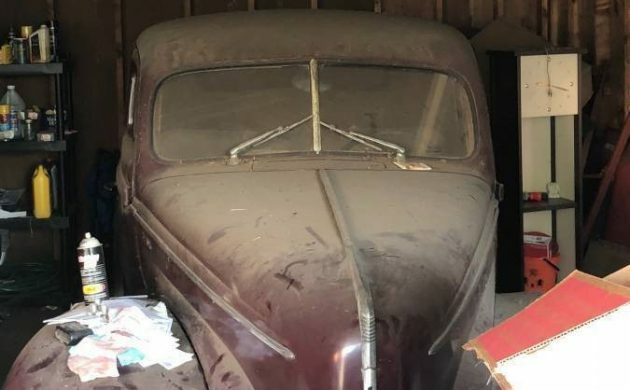 This 1940 Ford Coupe is a project car, but it may not be particularly daunting for a car that has been sitting for 45 years. The Ford flat-head engine is remarkably resilient, so it may actually be revived with little work. It is entirely possible that a thorough check and servicing of the drive-train could see it roar into life and be ready to hit the road. Personally, if it were me and that was the case, I’d probably leave the body and interior as is, and just enjoy the driving experience. That is one nice find! Sort out the mechanicals and hit the road. If you’ve ever tried to sell a car and received contacts (perhaps annoying) from companies offering to help you sell….for a fee of course…..the lister on this is one of them. I’ve been watching this one since day one on ebay and frankly am surprised at the amount bid. A lot of bids but not that many bidders. Sure, as usual for ebay there are a bunch of nickel/dime dreamer bids, but still it’s over $22k now with a high feedback bidder in the lead. Despite the claim of “completely original” the “one respray” eliminates that as an honest claim. It does have the somewhat rare hot air (as opposed to hot water) interior heater, but while you don’t see them often, the parts to add one to any ’40 are comparatively cheap. That funky bomb can white paint under the hood puts another falsehood to the claim of originality, and begs the question; why? And sorry Adam, that fabric is mohair which gets very fragile all over even when it only begins to show in limited areas. There likely won’t be any blind patching or serious cleaning action there. The seller wisely shows some under dash and fender shots that will give remote buyers a pleasant sense of condition. 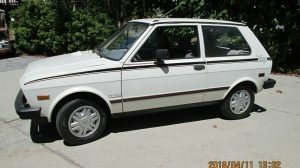 This one looks to be pretty nice considering it may have been on the road for 30ish years (I’m guessing limited though). All that said, while a decent condition, desirable car, there’s nothing real special here. 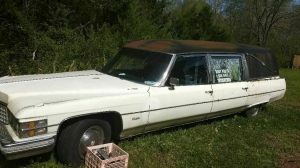 As a comparative, my deluxe coupe has very nice paint, straight bumpers, very good upholstery, with a dual carb and cammed 59 ab, near new tires, ready to go right now. I’d happily sell mine for an amount higher than today’s best bid that would be less than the cost to replace the upholstery on the ad car. The rest of the bennies would be “free”!! The market is a funny place. Uncle Bob- Right you are the market is a funny place…I have a complete hot air interior heater I bought years ago and never installed on my ’47..just waiting till its worth a million dollars. That art deco dash is the most beautiful of the 40-49 Fords……wanted a ’40 Woodie…….settled for a ’47 years ago. You ought put your car on Ebay and go fishing! nice, 2 in 2 days. I like the earlier model’s ‘true’ tear drop shaped head lghts (in yesterday’s listings). In the next 2 yrs ford didn’t keep the glass that shaped – but did w/the paint. Any one tha t thinks this find is not original needs to find another hobby. Why is a repaint any different than changing oil or replacing tires. It shows some one cared for something he loved. Lucky find for the new owner. I can’t agree more, I’ve played that song many times on this site. The concensous seems to be if it’s any other part of the car it won’t affect originality but for some unknown reason to mankind the paint which is nothing more than a metal protector doesn’t count. You just can’t mess with it. Maybe when all the planets align it will be revealed to us folks that don’t like rust buckets as to why touching the sacred paint is so taboo. My personally thought is there are a lot of guys caught up in the myth that cars like this are an investment that is garunteed to grow in value but only with the sacred paint. Or they’re just to cheep to budget for paint in their restoration. As always ,Uncle Bob and I are on the same page. This is a nice 40 Coupe, and if I wanted to build another 40 ,this would be an excellent choice. Its not the Holy Grail or the best of the best, and if the price exceeds 25K , it is not a steal ,and the buyer needs to be in love with it! “bastardizing the terminology”? Uncle Bob, I’m afraid that train left the station a looong time ago. “all original” means anything from ‘exactly as it left the factory umpteen years ago’ to ‘only a limited number of major modifications were done during the restoration’. As well as everything in between. It’s a lot like the term “classic”. What the hell does that one mean? 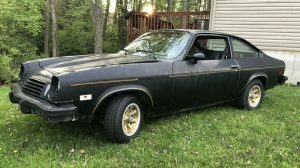 As for the featured car, I’d agree with canadainmarkseh that it’s a _very_ original car. I thought any car over 20 years old is now a classic and worth 10x book value. I’m just curious why Uncle Bob is so mad.. so what if Legendary Motor Cars is making money on the vehicle—it’s what they do. If your car is so nice—list it on EBay and see how it goes..
Up to almost $27K with a day to go. Like everything about it but that’s a lot of money. Saying that you don’t see too many 40 coupes this nice and mostly original. What’s with these clowns who pull a dirty filthy car out of a barn without washing it. I would think it would generate a lot more interest if it was at least clean. Any comment? I want to see the filthy in and out of the barn shots- but after that, please spend 5 minutes washing it down and show it to me wet if you want so I can visualize what it can be! I’ve been a car guy for far more years than I care to admit, but I have NEVER seen this hot air heater thing. Not even in pictures before. Is this something akin to the manifold heater on my Model A? I’m really curious, this must be an aftermarket thing. Anyone that can hook me up with a link or some info on this gadget? The artwork on the left side of the page gives you an idea of the hardware involved. It does take heat off the right exhaust manifold. The entire kit carried a 91A prefix part number so was a factory authorized accessory. Where the ducting goes in near the top of the firewall the “normal” ’39/40 cars had a blank stamping that was drilled out for installation. One thing you omitted is the listing has a ‘Reserve’ pricing and now after 68 bids and with 1 day and 23 hours to go, the bid is at $25,069.69. Someone being “cute” with their bid. Cute, but honestly interested? 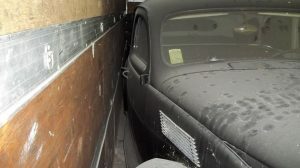 A 1940 Ford heater box brings as lot of money, I semi restored a 40 coupe back in the 80’s and paid several hundred for the original box back then. I didn’t need that piping they show here so I don’t know what that is about, maybe an aftermarket type. Most “original” 40 coupes I see nowadays have a 46-48 heater box which was more plentiful. I love this old ’40 Deluxe. If these are still being pulled out of garages in 2018, imagine how many other desirable collector vehicles are still hidden away as well. I’m sorry to hear that that happened to you, Ben. Scammers are a problem almost everywhere these days, and they ruin it for the honest people. I guess it’s always been that way to some extent. At least you can say that you’ve mostly had fun with it for a long time. I had both good and bad experiences on Ebay. Contrasting examples: ’37 Packard 110, around 10K in 2003, came from Canada and had to go through Customs. Seller took care of everything and when car arrived, it was the closest to Pebble Beach quality I’ve ever owned. 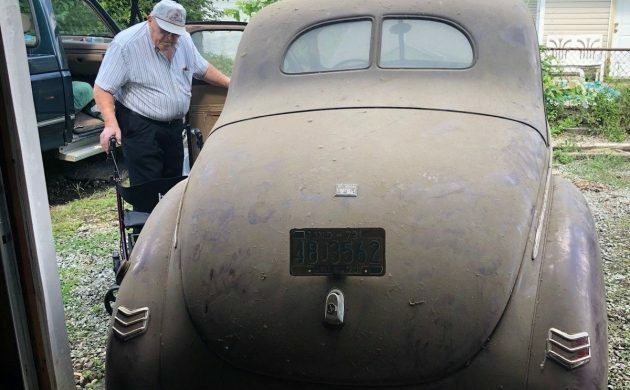 A year later, bought a ’38, similar price, car arrived and found the seller neglected to mention the motor smoked and couldn’t get the car up a local small hill. Body and interior were similar- only looked good in photos. we all would love to put this in our own garage. i would !!! This should make a good project for someone even it they do not want to keep it original. I still have my 39 DeLuxe Coupe that I purchased in 1959 and it has been stored since 1962 when I pulled the motor and Trans to do a rebuild! As it is often said “Too many projects, Not enough time”! I agree completely. Clean the damn thing! So you’re proving it was in storage … uncovered for a long time…. so what. I’d prefer it was clean and covered and taken better care of. A bunch of storage dirt just tells me I have a lot of rubber parts that need to be replaced. The market is weird. I had a 1940 Ford Convertible deluxe that was put in storage in 1975 by my father. It was pretty much identical condition to this one. I put it on Ebay about 2 or 3 years ago for 30,000. I never got any hits. In the end after having it listed a while, the highest offer I received was 16,000. It’s crazy how the market is. But I guess all it takes is that one buyer, and how long you are willing to wait to find one. By the way, I live 20 minutes from where this car is located. To me original paint means I don’t have to do any deep thinking of whats underneath that second or third coat of paint. As in bad body work. We just don’t have a standard of what constitute as “completely original”. Everyone sets they’re own standard. Such as rare when the factory pushed out 400 million units. Its rare if I’m going to believe your bull crap. The adjectives used to describe the car need to be left out. No surprise, already sold. Someone probably scored a great ’40 Ford Deluxe Coupe. except for the minority of people who participate in the CCCA, the word lost ALL meaning many years ago. 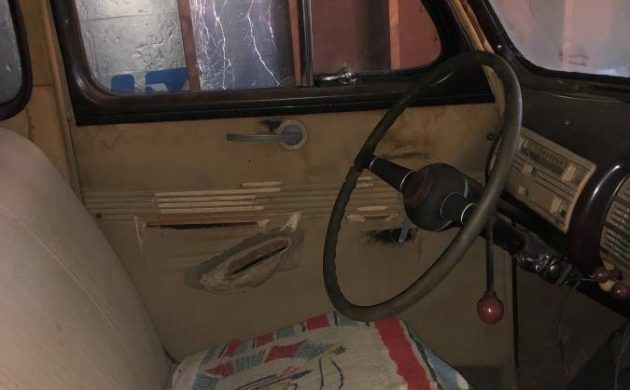 I can remember a time when a 40 Ford original hot water heater with the stainless trim on it and a good core would sell at Hershey or in Hemmings for almost as much as a whole 40 Ford coupe that needed restored! This looks like a nice car though. Sad to see this again – with the picture of the previous owner with his walker. Flipper payed way below what he’s now asking – he got spanked the last time around and should have dropped the reserve and sold it then. Now at a lower price of BIN…..geez the damn flippers.